Most people have a general idea of how to wash their face, but there’s a lot that the general public isn’t aware of. With all the products and tip out there, it can be confusing to know what to do to get amazing skin. Establishing a skin care routine is essential to keeping your skin healthy and beautiful. The steps below will help you establish an effective skin care routine. It’s important to determine your skin type so that you may chose the correct products and routine that will maximize the effectiveness of skin care. You should also take into consideration specific issues that your skin has. For a guide to figuring out what type of skin you have, visit our supplier’s website at http://www.skinceuticals.com/_us/_en/learn-about-skin.aspx. Below are the steps to establish a great skin care routine that will improve your skin’s appearance. No Touching Your Face – You can transfer acne causing bacteria from your hands to your face just by simply touching it. If you have to touch your face, wash your hands thoroughly, use a face towel or sanitize your hands. NEVER Pop Your Pimples – Picking or popping pimples prevents the skin from healing properly and will only make the irritation worse. Get the Products – Good skin care involves using a cleanser, toner, moisturizer, exfoliating scrub, cotton pads and a face mask. We can help you choose the best products for your face. Call 775-329-3100 for a free consultation. Remove Make-up Nightly – Never ever sleep while still wearing your make-up. Make-up that is left on overnight can clog the pores, and will prevent your skin from regenerating and breathing while you sleep. Order is Everything – The order in which we use skin care products matters almost as much as the products themselves. Even good products can cause irritation when not used correctly. The best order to use products in is: remove make-up, cleanse or exfoliate, toner, moisturize. Products to use Twice a Day – Cleanse, tone, and moisturize in the morning before you put on makeup, and at night before you go to bed. This will help prevent your skin from being clogged by dirt or make up, and feel healthier skin throughout your day. Cleansing Tips: Cleansing prepares your skin to receive nutrients from your other products. Before you cleanse, wash your hands so you won’t be transferring bacteria to your face. Toner Tips: Toner is used to restore your skin’s natural pH levels which were probably altered during cleansing. While you apply, be careful to avoid the sensitive eye area. Do not rinse. Moisturizer Tips: A moisturizer leaves the skin feeling softer and smoother. Moisturizers are not created equal, so be sure to choose the right moisturizer for your skin type or condition. Products to use Twice a Week – Throughout the week, it can be beneficial to use an exfoliating scrub in place of your cleaner, or use a facial make after you’ve cleansed you face. These products are too strong to be used daily; however, both treatments have benefits that your skin needs weekly. Exfoliating Scrub Tips: Exfoliating scrubs are essential because it removed dead skin cells which can leave your complexion appearing dull, and can clog up pores. A few times each week you should exfoliate with an exfoliating facial wash in place of your daily cleanser. Facial Mask Tips: There are many options for masks. Peel-off masks are best for blemished skin, whereas rich, moisturizing masks are best for dry skin. Apply the facial according to the instructions on the packet. Stick to your routine! Your skin needs time to get used to the products you use and how often you use them. Sometimes a negative effect appears at first, but this usually goes after the skin has time to adjust. Enjoy your beautiful skin! Take advantage of this H-O-T offer, just in time for summer! Joelle Greene is a registered nurse with over 30 years of experience. She is a graduate of San Diego State University with a Bachelor of Science in nursing. Joelle received her certification as a Women’s Health Care Nurse Practitioner in 1982 and has worked in women’s health since 1983. In 2001, she added laser treatments for spider veins, hair reduction and facial skin rejuvenation. In 2003, she joined the staff at Reno Vein Clinic providing laser treatments and more recently in 2005, she became certified in Cosmetic Botox, chemical peels and microdermabrasion treatments. 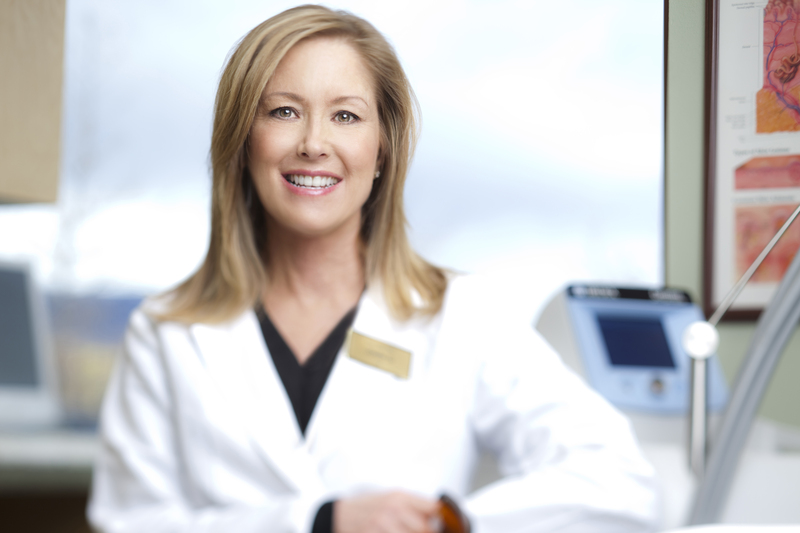 Joelle provides a complete program of individualized skin care from our medical skin care lines. Using her extensive training and background in women’s health, Joelle will provide you with the newest and most effective skin care treatments and laser treatments available.